In recent years it has been interesting to note how the market has moved in a variety of ways. With some exceptions, such as the Kangaroo and KGV head issues, the general interest in the regular issued stamps has remained fairly constant. The same cannot be said however, for the essays, proofs, varieties, errors, rare monograms and imprints, booklets or covers, as the interest in these areas has continued to grow. With a very limited supply in many cases, this has resulted in significant price rises; very significant in many cases, and indeed not always at the upper end of the market. There are many cases of lesser priced items being scarcer than the catalogue prices would otherwise indicate. For better quality, rarer or unusual and specialised material, the push on prices has emanated from several directions. Firstly, as new items are listed, or new information on numbers known and the like comes to the attention of the general collecting public via the publication of updated or completely new catalogue volumes, potential buyers become more educated, and the interest grows. Secondly, the now reasonably consistent rather than outright weak Australian dollar is still contributing towards an excess of material leaving our shores, resulting in a continued general shortage of quality items on offer in Australia relative to what has historically been on offer. Thirdly, there are increased catalogue prices in some areas, and worthy increases recognised by the market above that in others, despite being somewhat overdue in being recognised by some publishers. Fourthly, increased demand generally for quality and specialised material in particular is pushing up the percentage of catalogue prices required to acquire many of the key items, and even many of the lesser items such as plate flaws, retouches and other items. Together these factors have resulted in an unsurpassed market for specialised Australian and Australian Colonies material. 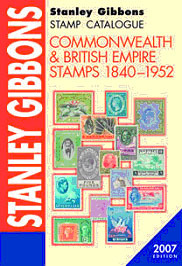 versions of the Stanley Gibbons Empire and Australia catalogues (SG), and even the most recently published versions of the various Australian Commonwealth Specialists' Catalogue (ACSC). This is not the fault of the catalogue editors; rather it is the result of market forces at work. In instances where a rare item comes up for sale, either at auction or privately, and particularly where there is no recent sale to be guided by, the reality is that no one knows exactly what it is worth until the hammer has fallen. Healthy competition is a good thing, and the philatelic market thrives on it. In recent years there have been many new varieties and listings added to the SG catalogues, and this has increased interest in a number of areas, and not just the most expensive ones. There are many collectors who collect by SG, and if it is listed, they want to have it. The same applies to the Scott catalogues, however, by comparison, their listings have fallen way behind. 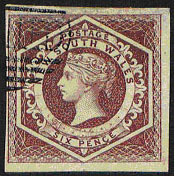 One example of a new Australian Commonwealth listing, is the KGV Rough paper 1d Scarlet no watermark error (SG 47k), making its entry in the 2007 catalogue, priced at £1,200 mint and unpriced used. Auction realisations have exceeded that price for over a year now, and it should be noted that used examples are also recorded, although they are certainly rarer than mint. This variety occurs in at least three rough paper shades. Although not listed in SG, the same variety also occurs in smooth paper, and I would recommend that the variety should also be added to that part of the catalogue. In the latter, only one mint example and approximately six used are recorded. If you are considering buying one of these note that it must show absolutely no trace of the crown over A or the line watermark to qualify as the listed variety. If you are in any doubt, seek reliable assistance, or obtain a certificate before committing to purchase such an item. 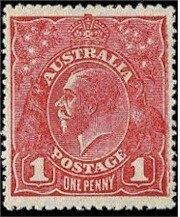 Although the smooth paper example above fetched a lower price than the others, and was a bargain at that price, there is no doubt that it is the rarest of the three stamps shown. It is my belief that over time more collectors will want to have these varieties, and I would anticipate increased demand as a result. However, the supply is limited, so do not be surprised to see the price rise further. Other recent additions to the SG listings include the roller flaw in the 1/- Lyre-bird watermark and no watermark stamps (SG192a and 230db), together with the roller flaw in the £2 Arms (SG 224da). Although they are not in the category of rarities, as with some other new listings, these are sure to become more popular as a direct result of being listed in SG. Some new illustrations of varieties are also in the current catalogue for the first time, including the popular ‘top-hat’ variety on the 6d Kookaburra, and the roller flaw on the £2 Arms. New varieties have been included in all six Australian Colonies and in the Australian Commonwealth listings in recent years. 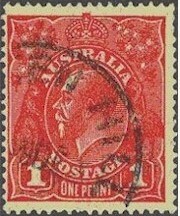 These include new listings of perf variations, watermark varieties and the like for each of the Colonies. 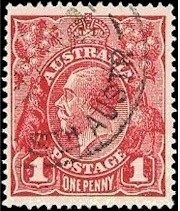 Going back a little further, it has been interesting to note the increased interest that has largely stemmed from the listing of the Perkins Bacon 'CANCELLED' stamps in the Australian Colonies listings in SG. With only six of each produced, of which the Royal collection has one of many, they are all great rarities, and during the last six years, they have more than quadrupled in price. The illustrations of these rare stamps below are all from the Jaffe auction, conducted by Millennium Philatelic Auctions in association with Spink, in March 2006. In that sale there were more than one example offered of most of these, and the ones shown here are the finest of those. Note that the important aspect of these stamps is the portion of the CANCELLED 'postmark' they show. 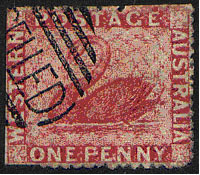 The South Australian 1/- is an unissued stamp; it is rare unused and not known postally used; whilst the other three are common as normal stamps. The following table lists a selection of the rarer watermark inverted errors, and demonstrate the extent of the very strong rises in recent years. 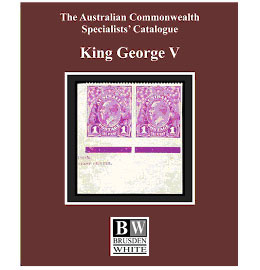 Although there are other factors involved, a significant portion of the increased prices for the inverted watermarks stems from their listing in the SG catalogue; this has also been 'assisted' by the listing of the numbers known in the ACSC. The prices shown are in £ sterling as they appear in the SG catalogue. With the overall prices above now at just over seven times those of 2000, the increases have been more of a steady nature than many might have thought. It is also true that some of the new catalogue prices had been blown out of the water' even before the new catalogue came out, with the sale by Michael Eastick and Associates of a second watermark 6d showing the watermark inverted at more than double the £8,000! Back in 1989, I was fortunate to be able to report the first known example of the ½d green Kangaroo with watermark sideways. 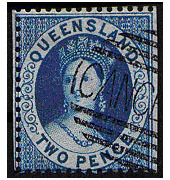 In our terminology, the standard watermark sideways has the crown pointing to right as seen from the front of the stamp, whilst the sideways reversed has it pointing to the left; by contrast, SG refer to the position of the watermark as seen from the reverse of the stamp. Although two slightly faulty examples showing the watermark pointing in the opposite direction were found following the listing of this error in the ACSC and SG, no others have since been reported. The discovery of such an item always generates significant interest when it is reported and listed, so if you do happen to find anything of this nature, I would be most interested to examine it. If it is in fact genuine as such, I can arrange to have it written it up and listed in the catalogue(s) if appropriate. However, you should always contact me prior to sending any items for examination. Happy hunting! It is with a great sadness that APTA advises of the passing of our esteemed member Simon Dunkerley. He joined APTA in 1985 and also exhibited at National level. Simon was the association's president during the years 1992-93 and has been a full time philatelic consultant for over 25 years. Simon was highly respected throughout philatelic circles world-wide and was well known for his research into specialised areas of Australian philately. Simon will be sadly missed by his fellow dealers and philatelists worldwide.